The Congress manifesto has identified kaam, or employment and growth and daam, or an economy that works for all, as key promises on which it would deliver if it were to form the government at the Centre. The party’s slogan for the polls is “Congress will deliver”, or “hum nibhayenge”. Gandhi said the manifesto had five key ideas, akin to the five fingers in the Congress election symbol of 'hand'. These he said are the party's minimum income guarantee, or NYAY, scheme to ensure Rs 72,000 per year to the poorest 50 million families, 2.2 million jobs by March 2020, or within a year of forming the government, increasing MNREGA work days from 100 to 150, a sperate Kisan budget and making non-payment of debt by farmers a civil offence rather than a criminal one, and increasing the expenditure on education to 6 per cent of GDP, and on health care to 3 per cent. On Prime Minister Narendra Modi and BJP raising issues of nationalism and Hindu identity, the Congress chief said "all were Hindus", but the real issues were farm distress and joblessness. He said the Congress party's NYAY scheme has changed the narrative of the 2019 Lok Sabha polls. On contesting from Wayanad in Kerala, he said it was a message of solidarity as southern India has felt left out by the Modi government. On jobs, the Congress manifesto has promised to create a new ministry of industry, services and employment to underline the link between the growth of new industry, service sectors and rapid creation of jobs. Gandhi said a Congress government would fill 400,000 vacancies in the central government, central public sector enterprises, judiciary and Parliament within a year of coming to power. He said a Congress government at the Centre would increase expenditure on education to 6 per cent of the GDP, and on healthcare to 3 per cent. As a condition for devolution of funds to these sectors, a Congress-led government at the Centre would ask gram panchayats, civic bodies and state governments to fill all vacancies, estimated to be 2 million. Gandhi said the Congress will ask state governments to create new ‘seva mitra positions’, nearly 1 million, in every gram panchayat and local body. The Congress manifesto states Modi government’s demonetisation costed Rs 4 lakh crore in lost output, lack of jobs and greater indebtedness. 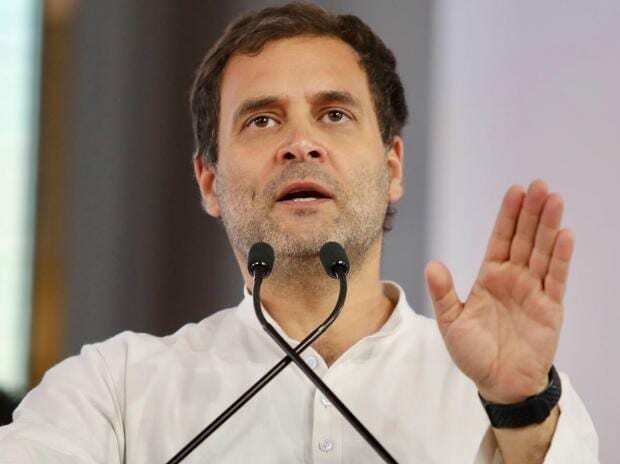 Gandhi said the Congress’s proposed NYAY, or minimum income guarantee, of Rs 72,000 per year to the poorest 20 per cent families of the country, will remonetize rural economy that demonetisation destroyed. He said just as UPA’s MNREGA rural income guarantee put money back in the rural and boosted demand and growth, so would NYAY. NYAY scheme would target elimination of abject poverty by 2030, the manifesto states. The target population of NYAY will be 50 million families. The money will be transferred under NYAY, as far as possible, in the account of a woman of the family. There will be a “design phase” of 3-months, followed by a pilot and testing phase of 6 to 9 months before a rollout. The rollout will be implemented in phases. The estimated cose will be less than one per cent of the GDP in the first year and less than 2 per cent in year two and thereafter, the manifesto states. It has also promised to create an ‘enterprise support agency’ to help entrepreneurs. The manifesto has committed to a three year “regulatory forbearance” for micro and small enterprises. They will be exempt from all applicable laws and regulations, except the minimum wages act and tax laws, for a period of 3 years from April 1, 2019, or in the case of new businesses, from the date of commencement of business. The Congress has committed to “reward businesses that create new jobs by lowering the effective direct tax rates and by lowering contributions to the CSR fund.” It has promised tax rebates to export-oriented industries, set up an “adequately capitalized Tourism Development Bank” to promote tourism business, and lower rates of corporate and personal income tax on tourism related business income. The Congress said it would announce a ‘make for the world policy’ under which foreign and Indian companies will be invited to invest in ‘exclusive export-only zones’, manufacture and export their entire production, pay no indirect taxes and pay a low rate of corporate tax. A Congress-led government would present a separate ‘kisan budget’, on the lines of the now discontinued practice of a separate railway budget, Gandhi said. The manifesto has promised to repeal the Agricultural Produce Market Commodities Act and make trade in agricultural produce – including exports and inter-state trade – free from all restrictions. The Congress will not allow criminal proceedings be instituted against a farmer who is unable to pay his or her debt, as debt is a civil issue. It will set up a permanent national commission on agriculture development and planning to examine how to make agriculture viable. The party in its manifesto has also promised to undo the “distortions” that have crept into the text of UPA’s land acquisition Act of 2013 and Forest Rights Act of 2006, “and the original purposes of the Acts restored and enforced”. The Congress has committed to achieve the fiscal deficit target of 3 per cent of GDP by 2020-21, and containing revenue deficit to 1 per cent of the GDP. It has promised to end the interference in the autonomy of the functioning of the Reserve Bank of India. “The angel tax imposed on start-ups will be withdrawn completely,” the Congress manifesto states. The Congress manifesto promises implementing the direct tax code within the first year of its government. Gandhi said the current GST will be replaced with GST version 2.0, based on a single, moderate, standard rate of tax on all goods and services. The rate will be revenue neutral to the current indirect tax revenues of the Centre and state governments. The GST 2.0 regime will levy a special rate of duty on demerit goods, the manifesto states. The Congress has promised that real estate (all sectors), petroleum products, tobacco and liquor will be brought within the ambit of this new GST with two years. It has promised that all goods and services that are exported will be zero-rated and not subject to GST 2.0. The Congress has promised to abolish the e-way bill. It has promised the taxpayer will be required to file a simple, single quarterly return and an annual return. The minutes of the GST Council meetings will be put in the public domain, the party has promised. The Congress has promised amalgamate two or more public sector banks so that there will be only 6 to 8 PSBs with a national presence and reach. The Congress has promised scrapping the NITI Aayog. It has promised to set up a new planning commission – a lean organisation with renowned economists and financial experts as members assisted by a team and staff not exceeding 100 persons. The Congress has committed to launch MNREGA version 3.0, that will increase the guaranteed days of employment up to 150-days, use MNREGA labour in restoration of waterbodies and wasteland regeneration and of MNREGA funds to build public assets, such primary health centre. It promises to pass the Right to Homestead Act to provide a homestead for every household that does not own a home or own land on which a house may be built. The Congress manifesto commits to implement the 74th amendment of the constitution in letter and spirit by introducing a model of governance to directly elect a mayor for a fixed five-year term and an elected council and a separate administrative structure for each urban body. Such a system already exists in some civic bodies in West Bengal.